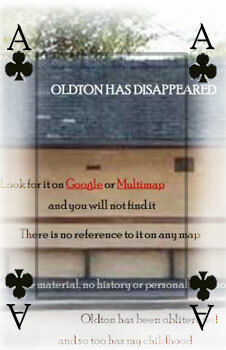 My Oldton pack of 90 per cent truth hints at a haunted future that awaits us all. Towns do disappear: they're knocked down to make way for motorways; they're submerged under reservoirs; swallowed up by cities; redesigned and relabelled as 'new towns'; reduced to rubble by invading hordes; appropriated by government departments; infected with anthrax or fatally irradiated; destroyed by fires, earthquakes and volcanoes. Sometimes they're simply abandoned by their citizens, who leave en masse in a search of new jobs, new loves, new lives. In the end my dad was following a natural process of walking away. We all do it in the end. We all disappear.